While second year quarterbacks can be a scary proposition, running backs can also be subject to the sophomore slump. Luckily there was not a big name rookie Phenom in Tampa Bay this season; I’m a bit gun shy with them after Cadillac Williams and Doug Martin. Still, there are a variety of players who could be contributors going into their second season and inquiring minds want to know who is worthy of drafting. We’ll get into that as well as how high some draft-worthy players should be taken to avoid a costly mistake. Although Johnson was not the marquee name of his draft class, he certainly showed something when given the chance. He has the look of an elite talent and was lucky enough to get an opportunity in a top tier offense. The situation could not be much better (subject to change based on the health of Carson Palmer) heading into 2016. I would go as high as the first round to land Johnson and I have trouble finding more than one or two backs that I would draft ahead of him. Gurley is a beast, but his team will hold him back a bit. 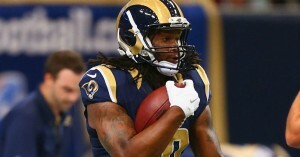 Gurley was seen as the top running back talent heading into 2015 and in some games he proved his supporters to be correct. Unfortunately he plays in an average offense and when better defenses stack the line against him, he struggles. While there is little reason to believe that this will change in 2016, he will still have HUGE games against weak to average defenses. I would go early second round for Gurley, but keep in mind that this is because I like a lot of receivers to go early not because I like a lot of other running backs. Allen was handed the Ravens starting job when Justin Forsett went down with a season ending injury. The results were a bit of a mixed bag, but this was in large part due to the fact that Joe Flacco was also lost for the season. The Ravens offense toward the end of the season was about as exciting as watching paint dry. I still like Allen’s talent, but the Ravens need to hope that Breshad Perriman comes back healthy and makes an impact if they want this offense to flourish. The uncertainty regarding the whole offensive unit makes me a bit gun shy when it comes to Allen, but unless they bring in a veteran he should be a feature back. I would say that late second round to early third round would be the range to look at Allen, but that might be a bit aggressive. Langford was excellent when he was used as the Bears’ feature back in 2015. He has nice vision and the ability to catch the ball out of the backfield. This is definitely a player to get excited about heading into next season as it looks like Matt Forte will probably be moving on to a new team. I think that Langford should be off the board within the first three rounds and he would be a bargain in round three. This all changes if Forte is still in town, but I think that ship has probably sailed. Gordon may prove me wrong, but I'll pass in the draft. Gordon looked like an elite talent coming out of college, but his rookie year was not one for the ages. 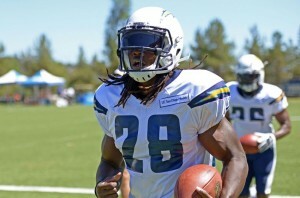 He was derailed by Danny Woodhead and then by injury. I still like his talent, but there is a definite possibility that he will not pan out at the highest level. Dynasty owners will have to wait it out due to his potential, but in redraft leagues I think that Gordon is a dangerous pick. Another former Charger back took a couple of seasons to pan out (Ryan Mathews), but Gordon is a gamble that I’m not taking in 2016. Yeldon had some flashes of brilliance in his rookie season but in large part he was just decent. This is sort of the hallmark of Jaguars running backs since the prime of Maurice Jones-Drew and I do not see it changing in 2016. It will be another season where Yeldon has some nice games and he certainly deserves a roster spot, but I would not draft him among the top 15 to 20 running backs.